Sorry, we have no availability online for the selected dates. Please note that minimum stay restriction may apply for your search dates. This double room Deluxe, up to 36 m², includes an elegant furniture, a bathroom with bath or shower, modern décor, private terrace and amazing views to the sea from where to enjoy from a snack during the evening, until an unforgettable breakfast. With 40-50 m² of floor space, the superior Vista Mar of the Hotel Pure Salt Port Adriano rooms are ideal for 2 guests seeking luxury and ease. 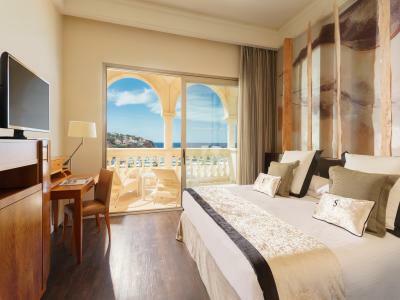 Located in the main building and equipped with amenities of the highest quality, a furnished terrace and amazing views of the Mediterranean, these rooms promise rest and relaxation. Inspired by famous paintings of the Renaissance, these 60 m2 adult-only suites offer a spacious bedroom with all luxury of details: en suite bathroom with bath tubs and shower sensations, private terrace, Bulgary amenities and amazing views of the sea. Perfect for those who want to relax and enjoy all the amenities and services of a deluxe room. Relax while admiring the stunning sea views from your private outdoor Jacuzzi. Thus Junior Suite, approximately 60 m2, offers a bathroom with bath tubs and separate shower, modern facilities, stylish design and a private jacuzzi on the terrace. 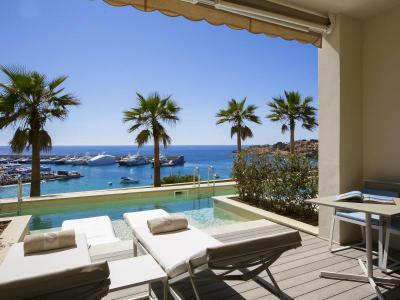 This Swim Up superior room overlooks the Sea and offers private access to the river-shaped pool. 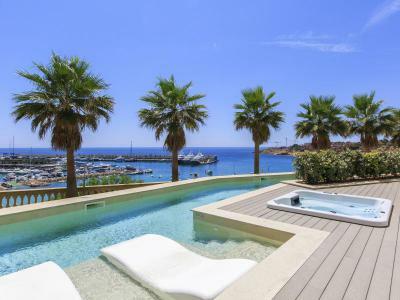 Designed for two guests, these suites of approximately up to 46 m2 include submerged sun loungers on the private terrace, a bathroom with exclusive toiletries, views to the sea and the luxury of being in front of the exclusive Port Adriano Marina. The Swim Up Renaissance suite overlooking the Sea offers private access to the river-shape pool as well as a decoration inspired by the world of classical and contemporary art. 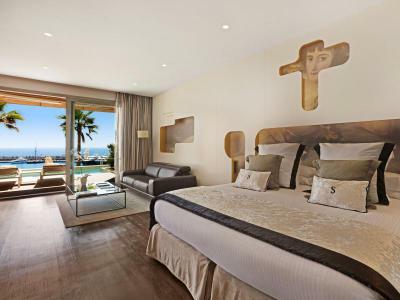 Designed for two guests, these suites of approximately 60 m2 include submerged sun loungers on the pool, a bathroom with exclusive Bulgari toiletries and a hydromassage bath with integrated television, views to the sea and much more. This Swim Up ocean view with Jacuzzi offers private access to the river-shape pool, 2 submerged loungers a furnished terrace, and an outdoor jacuzzi for your private use. This room reflects luxury and elegance with a modern design inspired by contemporary art and a few amenities to meet every one of your wishes. A sauna, a sensations shower, a Jacuzzi bath and a internal private garden are all the distinctive marks of this elegant suite of 75 m2. 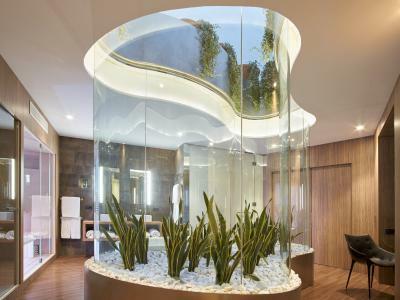 Perfect for anyone who wants to join the experience of a luxury hotel with a well-being center typical of a Spa. 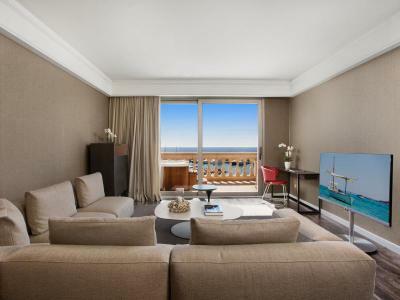 The "O" Suite ensures a relaxing and restorative stay thanks to its elegant and luxurious facilities in the room and offers amazing sea views from a private terrace where you can enjoy wonderful sunsets. The Adriano Suite is 115 m2 of pure luxury and it offers an elegant living room, a spacious dressing room and a bathroom. 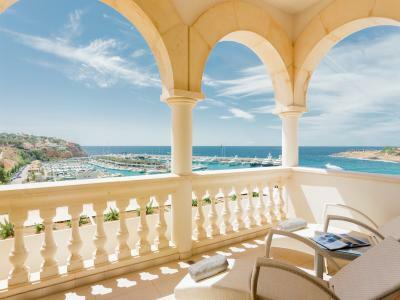 It also has an exclusive private terrace with jacuzzi where guests can relax while admiring the fabulous views to the sea. Disconnect in the lounge and let yourself be pampered by one of the many services provided by the hotel or relax in the private Jacuzzi while the sun goes down behind the sea.